Over the last couple of days I’ve been onsite at the ALT-C conference in Manchester UK. This is a rather large conference (over 500 participants), mostly educational technologists in the UK. As with any large conference, there are cliques, which are great if you are in them, and not so great if you are not. 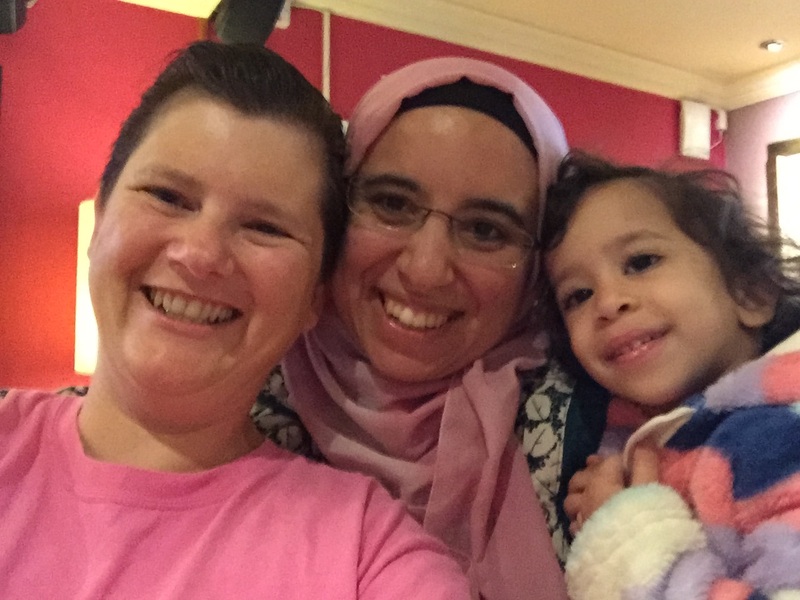 For me, the ALT-C conference was all about meeting Maha Bali in person, and spending time with her. 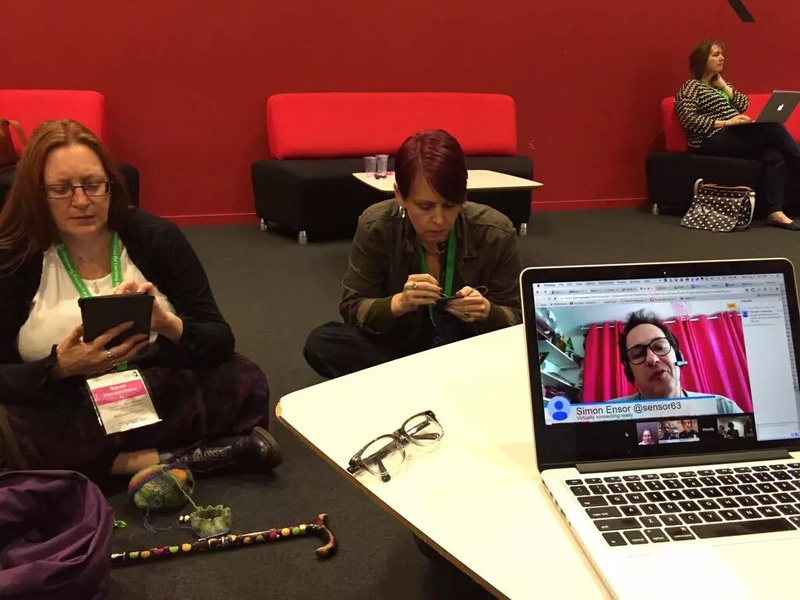 It was also about being onsite for Virtually Connecting – something I have not done since the initial virtually connecting at the OLC Emerging Technologies and Learning (#et4online) conference. It was Maha’s first time being an onsite buddy. I loved the opportunity to show her what I vconnecting looks like from my side of the camera. Over the course of two days, we did five virtually connecting sessions, four of which were at the conference, and one which was a more informal hangout with Maha and I shortly after we met for the first time. What I love most about hosting vconnecting sessions onsite is how the sessions enable people to connect. In some ways, it gave me an opportunity to speak to people I otherwise would not have reached out to. It was those connections that make this project worthwhile for me. I also saw how it gave other people an opportunity to connect – I saw a fostering of connections that I had not anticipated. One challenge we face with vconnecting is to not have it take away from the onsite conference experience. It is a difficult challenge – and one we are most often criticized for. Virtually connecting is still evolving. We are trying to figure out ways in which to make it mutually beneficial. There is a lot to it that is not seen – and those unseen parts are what matters. The connections that are deeper because of all the logistics that go into planning a session. The connections that happen after the cameras are off – both onsite and virtually – the conversations don’t stop just because we have turned off the live stream. Doing too much vconnecting while onsite does detract from the conference experience. It is about balance. We hope to have more people involved onsite, such that one person isn’t overwhelmed with the responsibility. We also will try to limit the number of sessions. A lot of energy goes into making them happen. My ALT-C experience was about making deeper connections – it wasn’t about volume of connections, rather about depth of connection. After the OLC Emerging Technologies and Learning conference and the SMSociety Conference, I had reflected on being a conference insider. At ALT-C I was definitely not an insider. I knew very few people – however, virtually connecting gave me a reason to talk to people. It gave me chance to be part of a clique within the conference – almost like a conference within a conference. The connection that deepened the most was my bond with Maha Bali. We are friends, buddies, kindred spirits. I am so glad that I had the privilege that has made this connection possible.